Teen Read Week is a celebration of teens reading “for the fun of it.” We really had a jam-packed schedule of events this year because it coincided with local parent-teacher conference dates when middle and high school students had days off school. I wanted to share an overview of our slate of programs because they could easily be implemented year-round. I applied for a YALSA/Dollar General Teen Read Week grant to fund these programs and the library was awarded the funds. If you’ve always wanted to put on a big program but don’t have the money, consider applying for next year and check out the other exciting programs that were implemented with the other grants (there are links at the bottom of the post). My wonderful colleague Karen and I had been talking about doing a dystopian/post-apocalyptic themed scavenger hunt for a year or so. She’s done awesome hunts of all size and scales previously, so she had the technical know how, and we thought the current trend in young adult literature would be great inspiration for a hunt. Zombies. Environmental disaster (in the form of events like supervolcano explosions). Civil rebellion. Aliens. The end of the world is a persistent and popular theme in fiction, and these titles are popular at my library. Though we heavily marketed the event to teens, it was all ages, and we had several families participate with their teens and younger siblings as well a couple teams of twenty-somethings, a group we don’t always reach at the library, which I thought was cool. We had limited it to 15 teams and had full registration, and 12 teams ended up actually competing. This event was very community-oriented. Most clues involved local history or trivia and we had the participation of several local businesses and media outlets. Though putting scavenger hunts or programs of this nature together involves a lot of staff work, they are tons of fun. You can see some photos submitted during the event on the library’s Tumblr. At some point, I plan to share a post that goes into more detail about planning and implementing these types of programs. For now, you can read a little bit more about it on the YALSAblog, where KC librarian Amanda wrote a very cute post about our plans in “choose your own adventure” style. 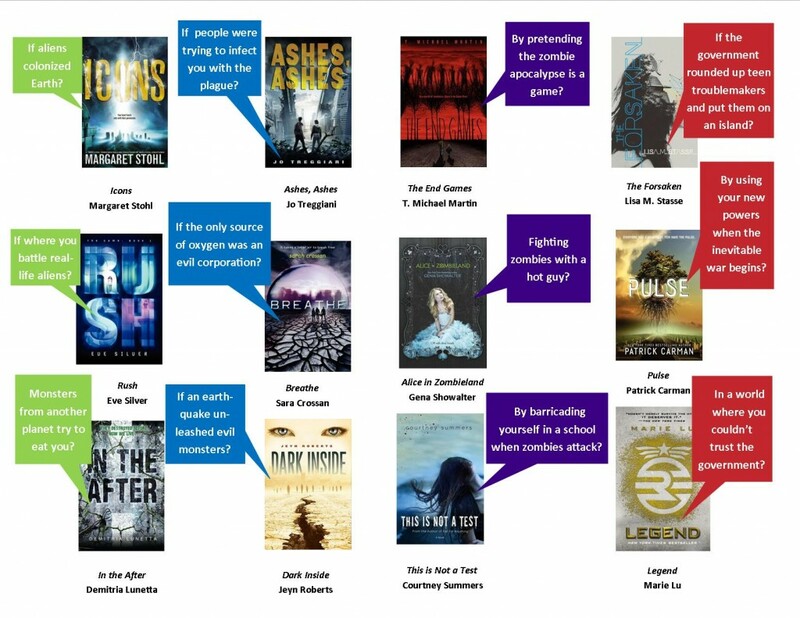 To go along with the event, I also made a booklist flowchart. You can see the full version here. We were able to inexpensively bring author Mike Mullin for an appearance because he was coming to KU’s YA Lit Fest, and we’d be able to hold a free event for the public for those who couldn’t attend the Lit Fest. I’d read good things about his presentations at schools on volcanoes and martial arts, and his book had been popular with some of the regular gamer guys who hang out in my library, so when he said he’d be willing to do local events in conjunction, we jumped on the chance have him at the library. Since our library is under construction and we only have a smaller event space, so we’ve been lucky to partner with other locations for events. This one was held at KU’s Natural HIstory Museum, and they even helped with the marketing. This made for a very diverse crowd—a lot of older (think elderly) people came, including some professors who study this kind of stuff, as well as younger kids and teens, so that made the discussion very interesting. Mike’s presentation was engaging and informative, and I’d say the whole event was a success. One of our regular patrons interviewed him after the event, which was cool (I’ll share a link when we get it up on YouTube). We also purchased a book club in a bag set of Ashfall. I had class this weekend so Karen stepped in and led book club this month, so I’m not sure how it was recieved by our regular members, but I’ll be interested to find out (I still haven’t had a chance to read it myself. Audio version is in production, but not yet released). We rounded out the slate of events with a story terrarium competition, but ended up only having one entry. I think this kind of program requires a lot of effort and possibly even some money on behalf of patrons, and since we had so much going on, we possibly didn’t promote it heavily enough. I still think this is a fun idea for a program, but am not sure about the best way to implement it. 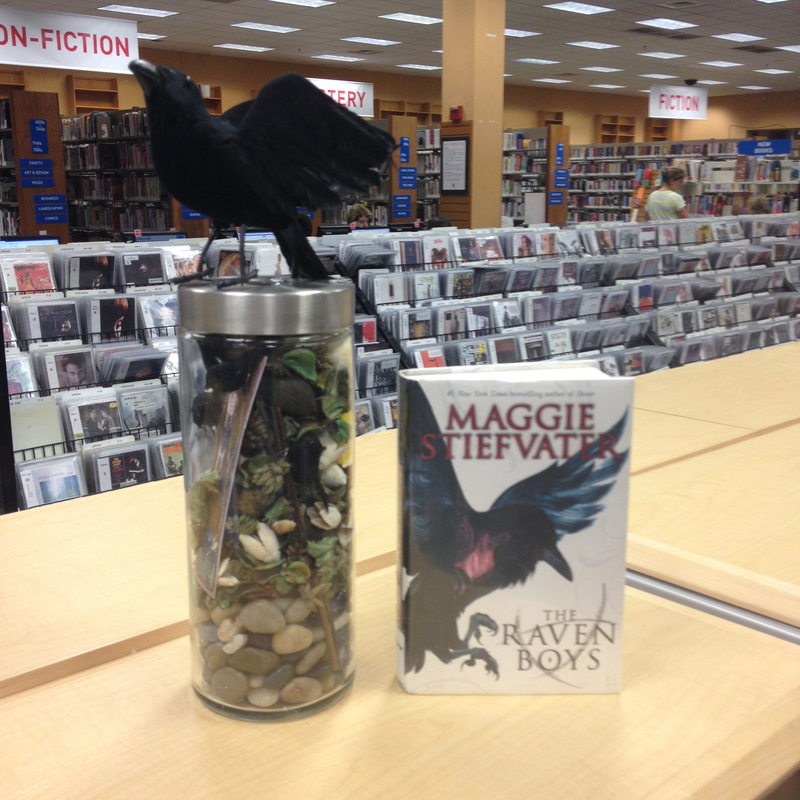 At least I had fun making my example based on The Raven Boys, and it will happily live on my bookshelf in my office. We ended with a book and media swap, which is an easy, fun way for kids to get new books and DVDs and games and for me to clean out a bunch of ARCs. Did your library celebrate Teen Read Week? This sounds awesome! Do you have more details on planning this type of event? BTW… went to KU and LOVE Lawrence! Hi Molly, I LOVE this idea but hit a dead end trying to track down the promised scavenger hunt article for Novelist promised in the YALSA blog. Did that ever come to fruition? DUDE. I ended up writing about a different topic for the programming issue of Kids and Books NoveList newsletters. BUT I have an email I’ve sent out to several people that kind of goes over how I do scavenger hunts programs at my library. I keep meaning to write a comprehensive blog post about it here but haven’t gotten around to it yet. I did submit a proposal to talk about it at ALA next year so if that’s accepted I will be all over it :) I will email you some plans/general outline of instructions! Do you have more details as to the planning of the event? It would be nice to do something like this in our community. It was a ton of work, but totally worth it! You run such an amazing program at your library. I love reading about it, and I always enjoy your flow charts! Toronto did this really amazing Fahrenheit 451 scavenger hunt game that was a big inspiration for this! They have a pretty cool library system up there, too.